We connect you with the top publisher websites in the world. Drive traffic with performance-based advertising. Consorte Marketing has all of the right publisher connections to get your affiliate program to the next level. Our program management team is US-based and will work with you on any affiliate network, including but not limited to: Linkshare, Commission Junction (CJ), Shareasale (SAS), eBay Enterprise Affiliate Network, ClickBank and Link Connector. Also be sure to contact us if you are an advertiser looking to transition from the Google Affiliate Network (formerly Connect Commerce, now GAN) to another affiliate network. 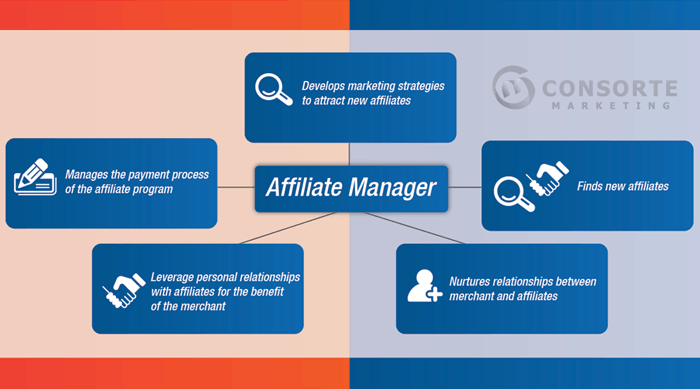 As a seasoned team of affiliate program managers, we find that large affiliate networks as mentioned above scale better than homegrown programs. However we’re happy to work with you on any affiliate platform, such as Direct Track, shopping cart plugins (Magento, Zen Cart, etc) or your proprietary software. We’ll set expectations so that there will be no surprises and you can determine whether there’s an ROI on our affiliate marketing services. 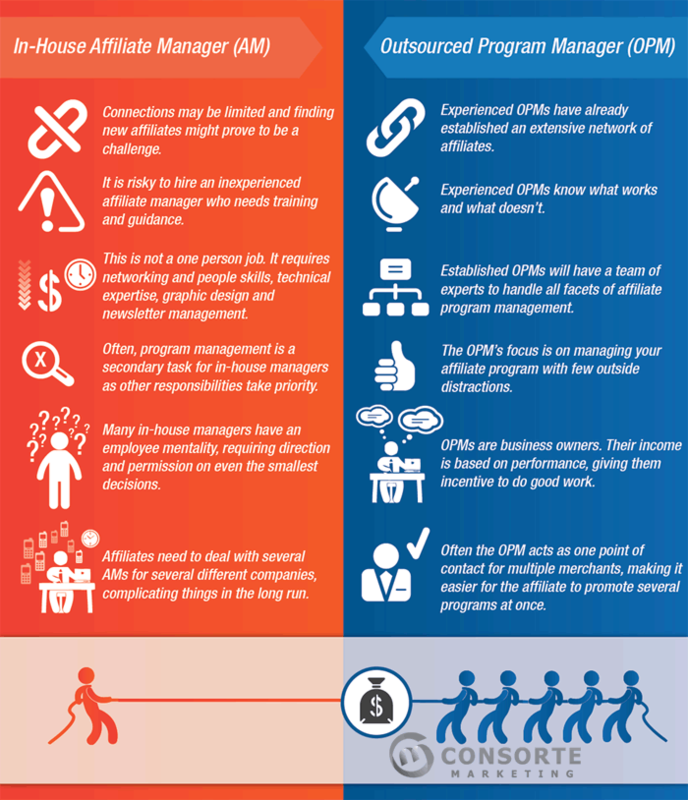 From the chart below, you will see the many benefits to hiring an outsourced program manager like Consorte Marketing, over hiring an in-house affiliate manager. The typical e-commerce website offers numerous products. This is typically the best scenario for affiliate marketing to be successful. It’s much easier to market several hundred, or many thousands of products through the affiliate channel than to market a single product or a small collection of items. We achieve part of our success as your partner in growing this side of your e-business by direct outreach to top performers such as high-traffic websites that offer coupons online, comparison shopping engines and websites specific to your industry. Another large part of the success with an affiliate program with numerous items for sale is to develop, syndicate and promote an optimized product feed, specific to the affiliate network you’re in. It is generally more challenging to promote a single item or small product line. For example, you may have a single skincare product for sale such as an anti-acne cream. We have experience in this realm and can deliver results if your product is compelling. Generally we would prefer to test the offer through pay-per-click advertising before engaging in the affiliate channel, to make sure that there is a need. You would hire us to run a small test for enough data to achieve statistical significance. We are selective about the programs that we promote and we’ll let you know if we think it can be successful. Generally speaking, a product with multiple successful marketing channels such as a made-for-TV or infomercial offering that has some branding behind it will be much more successful than that jar of strawberry jam centered around Grandma’s secret family recipe that has never been mass marketed. At Consorte, we have the right experience promoting lead-gen affiliate campaigns. Depending on your product or service, we’ll design a campaign specific to your needs and reach out to publisher websites that should deliver optimal results. We can promote educational programs online, financial services, e-zines and other lead-generating websites. Generally we’ll do this through numerous CPA networks (cost-per-acquisition) rather than the larger affiliate networks. The model is substantially different than ecommerce so the first step would be to measure viability and develop a plan for success. Your product or service may do very well in the arena of pay-per-call. Similar to pay-per-click advertising, you only pay when someone picks up the phone, calls your company and engages in a conversation for a minimum duration. This works very well if you have talented sales-people on the other end of the line, but will not work well if you’ve just got customer service reps (CSRs) who are just “order takers.” If you’ve got the right staff in place and want to talk about pay-per-call marketing through the affiliate and other channels, then we’re ready to help. Our goal is to be your online business partner and our philosophy is to grow with you and your company. We’ll help you determine if affiliate marketing is right for your specific business and we’ll carve out a plan that makes sense. Our mission is the same as yours – get traffic, convert that traffic to sales and realize a profit for your company. If you like what you see, then hire our affiliate managers and grow your ebusiness through this pay-for-performance, commission-based marketing channel.